Update 2015-10-04: Beginning with Breadcrumb NavXT 5.3.0, RDFa Breadcrumbs are deprecated in favor of Schema.org BreadcrumbsList, which Google now prefers. 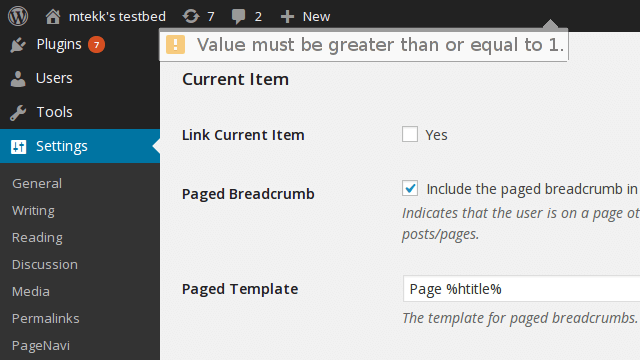 Please see the new article on implementing BreadcrumbsList with Breadcrumb NavXT. While the Google microformats for Breadcrumbs are verbose, ugly, and deprecated, to date, Google still doesn’t support Schema.org breadcrumbs. Thus, we’re going to have to live with the ugly RDFa format for the time being. While there is no ‘one click’ configuration for RDFa breadcrumbs within Breadcrumb NavXT, support for them is not too difficult to configure. To begin, the wrapping div for the calling code needs to have xmlns:v="http://rdf.data-vocabulary.org/#" added to it. Below is an example calling code block for users of the regular bcn_display(); function. To jumpstart this replacement process, you can import the following Breadcrumb NavXT settings XML file. Breadcrumb NavXT RDFa Breadcrumbs settings file (Right click and select “Save As”). Depending on the version of Breadcrumb NavXT, the typeof attribute may not be accepted in the settings (it will get automatically stripped out). To fix this follow the process outlined in How to Add li and Other Tags to Breadcrumb Templates to add the typeof attribute to the span HTML tag. Otherwise, wait for Breadcrumb NavXT 5.1 (or 5.0.2) to be released. Value must be greater than or equal to 1. This message is caused by the value of “Max Title Length” being less than 1. Some modern web browsers, such as Chrome will display this warning (and in some cases it may appear to come from the admin bar as in the leading screenshot). While, others, such as Firefox, will not (and will not prevent you from saving your settings). To fix this issue, change the value of “Max Title Length” to be greater than 0. If you do not want your breadcrumb titles to be restricted in length, make sure “Limit the length of the breadcrumb title.” remains unchecked. You should now be able to save your settings. Back in Breadcrumb NavXT 4.2, the breadcrumb “Max Title Length” setting was split into an enable switch for restricting the length of breadcrumb title and a second option for specifying the maximum length. Previously, setting the max breadcrumb title length to 0 was interpreted as disabling the title length trim feature. This was not entire intuitive hence the switch. When this switch was made, the new “Max Title Length” was changed to the HTML5 number form input element, with a minimum value set to 1. Additionally, Breadcrumb NavXT started shipping with 20 being the default “Max Title Length” value, with the title trim feature turned off by default. Thus, new users of the plugin will never see this issue. Additionally, the next release of Breadcrumb NavXT will have a modification which will not allow Max Title Length to be 0 when a user upgrades versions (will automatically correct it to the new default of 20). Breadcrumb NavXT was just updated from a pre-5.0 version, please go to your plugins page and activate “Breadcrumb NavXT”. Also, deactivate “Breadcrumb NavXT 5.0 Migration Compatibility Layer” to make this message disappear. To make this message disappear, navigate to the Plugins section of the WordPress admin. First, you will notice “Breadcrumb NavXT” in the list of plugins is not active, at this time you will want to activate it. Next, you will see a plugin named “Breadcrumb NavXT 5.0 Migration Compatibility Layer DO NOT ACTIVATE” deactivate this plugin. In version 5.0, the file layout of Breadcrumb NavXT was reorganized. Due to this reorganization the plugin header information moved from breadcrumb_navxt_admin.php to breadcrumb-navxt.php. Additionally, breadcrumb_navxt_admin.php was removed from 5.0. Unfortunately, WordPress does not handle the change in plugin header location very nicely. Starting with 5.0.1, breadcrumb_navxt_admin.php was added back to the plugin, with a plugin header. However, this file now only exists to serve the notice to users about activating the plugin. Additionally, in Breadcrumb NavXT 5.2 this file will no longer be included with the release. No, Really, Why is this Necessary? Yes, the breadcrumb_navxt_admin.php file could automatically activate the new plugin file, and then deactivate itself. However, that sort of behavior is something plugins probably should not be doing, especially ones that are distributed from WordPress.org. So instead, the end user will have to intervene. Unlike most semi modern hardware, the CIR module provided by Nuvoton does not work out of the box in Windows 8. Additionally, the Windows 8 drivers (version 2.5.1003) that are linked to on all of ASRock’s motherboard pages do not work in Windows 8.1. The driver installation fails silently, giving the cryptic “This operation requires an interactive window station” error in Device Manager. Fortunately, there is a Windows 8.1 driver, its version is 2.9.1007 and you can find it on the driver’s page for ASRock’s VisionX series mini PC.